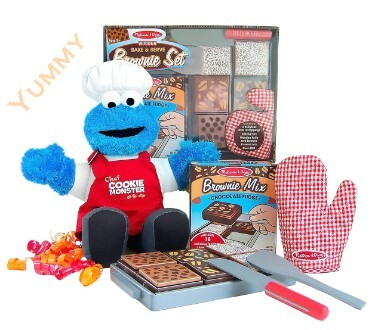 C is for Chef Cookie Monster in this fantastic Sesame Street gift set! Your little baker will love this set, complete with plastic brownies, toppings, utensils to cut and serve the brownies, and an oven mitt. They will be making brownies for everyone right along with Cookie Monster! Gund's 17" Teach Me Cookie Monster helps with development of every day skills with pocket snaps and buttons, a shoe zipper, shoe touch-and-close fastener, apron buckles and back ties. Great as a birthday gift, big brother, big sister or just because! All comes beautifully packaged in clear shrink wrap for secure shipping and topped with a matching bow for an extra special touch.